Winner of the Elixir Press Eighth Annual Poetry Awards. Her book was chosen by Jake Adam York who had this to say about it: "PERPETUAL CARE fulfills two of poetry's most important offices, perhaps its two most important offices, it cares for its world, and it cares for its language. 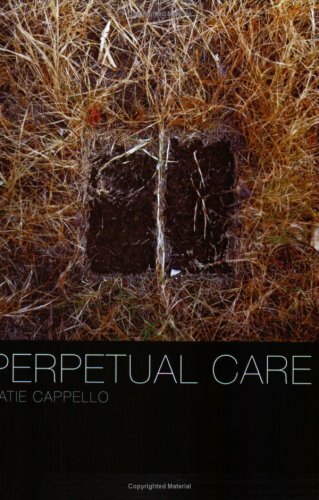 Cynthia Hogue said this: "The poems in Katie Cappello's exquisite debut volume, PERPETUAL CARE, are both delicately surreal and precisely observed: the man who gives back change has blackened it with smudges from newsprint, a bakery tart' s glazing is as shiny as a sports car, a blue feather swings through the air like a pendulum. Memory and word fuse, keen. These poems are fresh and astonishing, and Cappello's is an original and originary new voice."